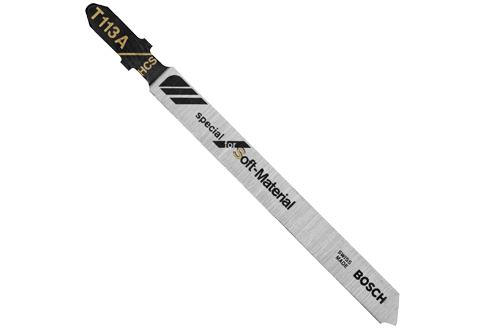 I purchased a 3-pack of these Bosch T113A3 4″ T-shank jigsaw blades to make a go at cutting some 1/2″ Homasote that I will be using as subroadbed on the layout. My intent was to avoid the legendarily bad dust that is created using conventional wood-cutting, teethed blades. I have seen these type of blades around but never given one a shot. My initial impression was that the blade appears to be sharp and is wedge-shaped. It loaded easily in my DeWalt jigsaw and operated well. The initial cut into the Homasote was smooth and steady, to be expected and at first it seemed that it would work well. There was little dust. However, there was another problem. Smoke. Yep, after about 3-4″ the material started smoking heavily. I removed the blade from the material and the blade itself had burn marks on it. I switched to a regular wood-cutting blade and went back to cutting and it all worked out fine. TL:DR: Knife-edge jigsaw blades are inappropriate for cutting Homasote. Stick with wood-cutting blades outside, with plenty of ventilation and preferably with a breeze to blow the dust away. Wear a mask!